Created by Jeff Erickson for a STEM Fair put on by Navigant Consulting at the Verona Library in Verona, Wisconsin on April 25, 2015. 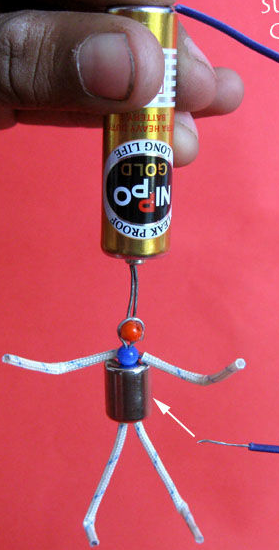 Simple motor with paper clips. Source link. Seven different simple types in a YouTube playlist. 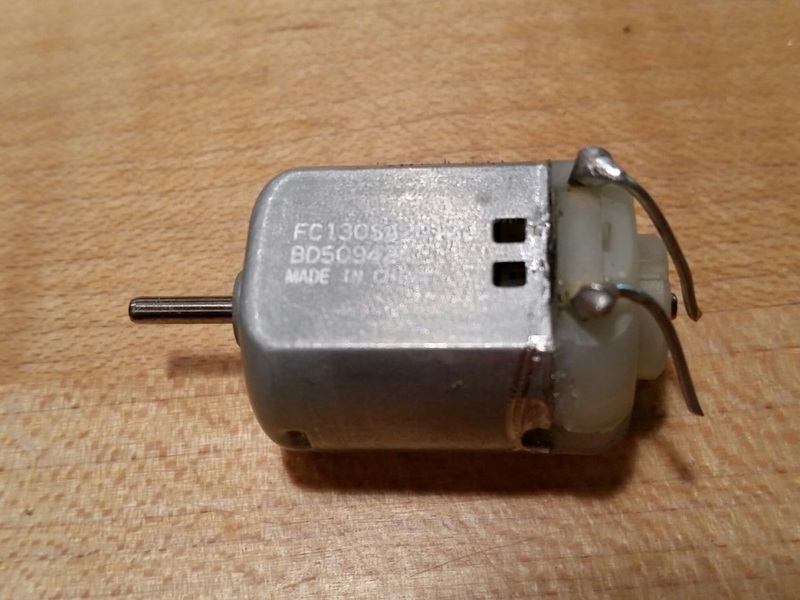 Description of regular DC electric motors on ExplainThatStuff.com. Version 1 and Version 2. Electricity flowing through a wire creates a magnetic field. 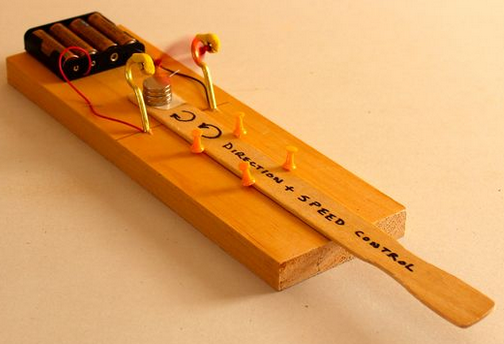 You can use that effect to create an electric motor. 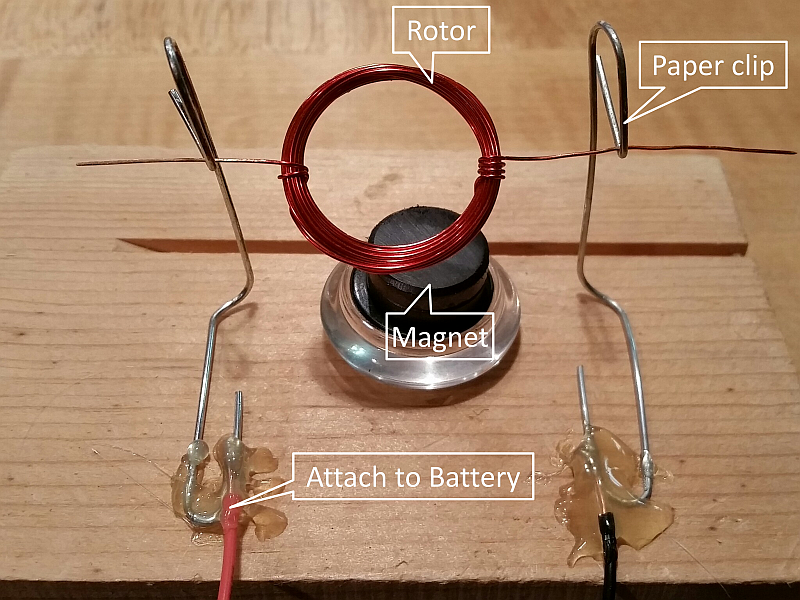 Create a rotor by winding motor wire in a circle leaving wires coming out opposite ends. Sand or scrape the insulation completely off one wire and off the top half of the other. When you connect the wires to a battery, electricity flows through the coils, creating a magnetic field. 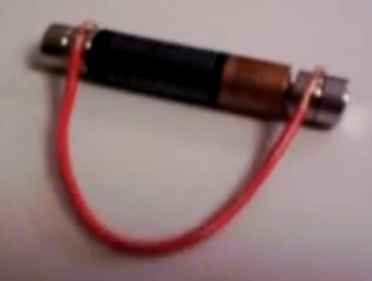 One end of the coil will have a positive polarity and the other negative. 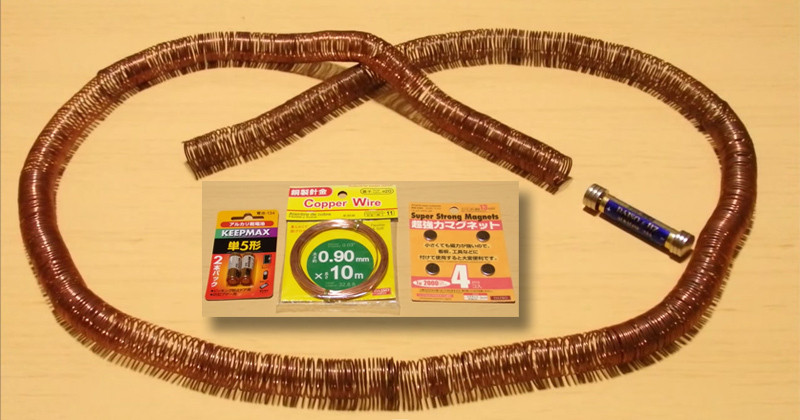 The coil will try to line up with the magnetic field created by the permanent magnet. Opposite poles attract and the same poles repel. 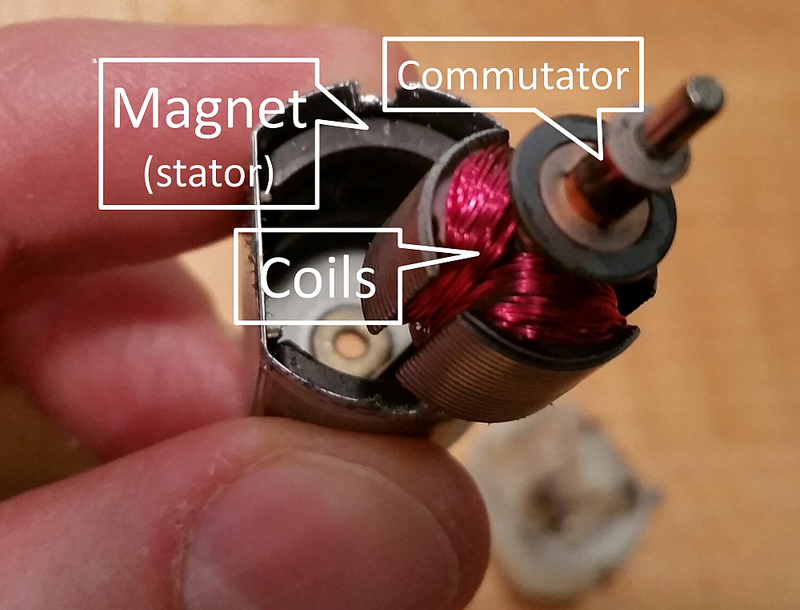 The motor will try to line up one side of the coil next to the permanent magnet and stop. However, since the wire on one end still is half insulated, you have created a rotating switch. 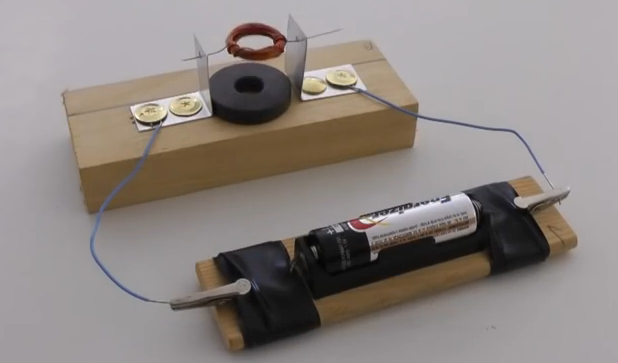 As the coil spins, the current is blocked and the electromagnet loses its attraction for the permanent magnet. However, because it is spinning, it does not come to a rest. 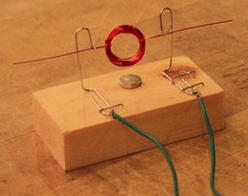 It spins until the wire end rotates past the insulated part to the uninsulated part and again conducts electricity. Then the electromagnet reenergizes and pulls toward the permanent magnet again starting the cycle over again and you have a spinning motor! 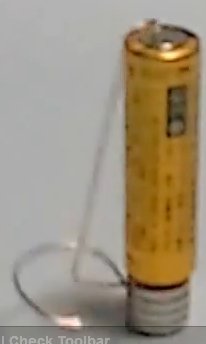 A homopolar motor creates rotational movement through the Lorentz force. 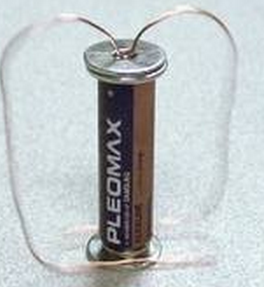 Electrical current flows from the positive terminal of the battery to the negative and into the magnet. 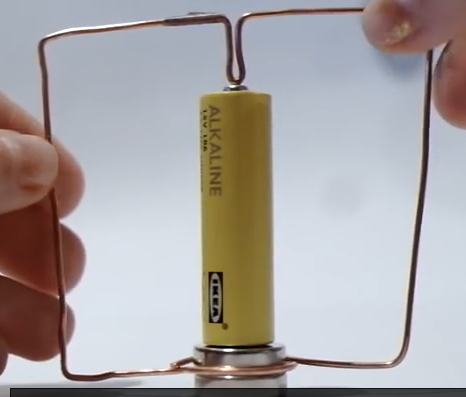 This current then flows from the center of the magnet to the edge where the wire connects, it travels up the wire back to the positive terminal of the battery and the circuit is complete. 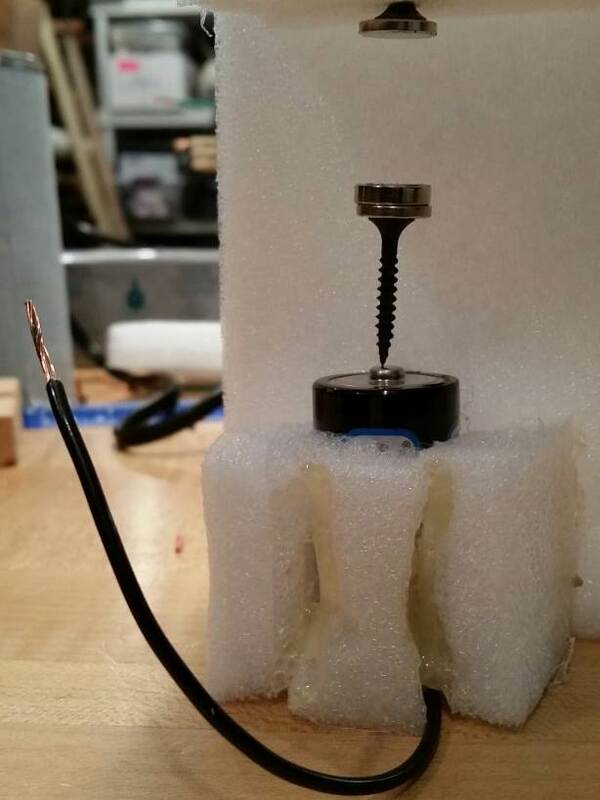 Key to the motor movement is the direction of the current and the magnetic field produced by the permanent magnet. 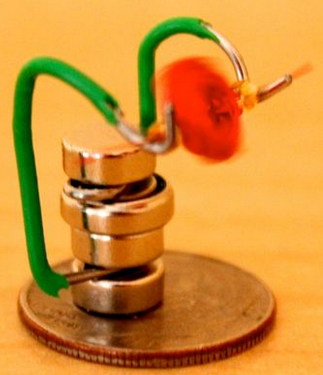 When you touch the wire to the side of the magnet on top of the screw, you complete an electric circuit. Current flows out of the battery, through the screw, sideways through the magnet to the wire, and through the wire to the other end of the battery. The magnetic field from the magnet is oriented through its flat faces. 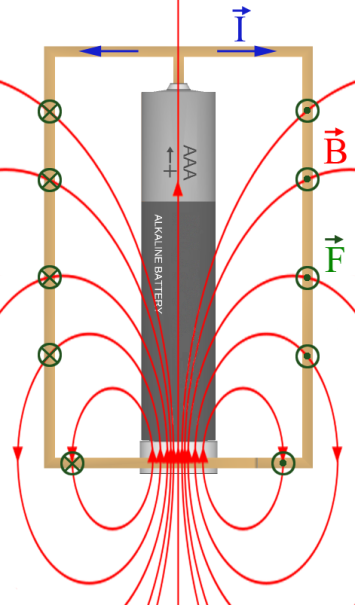 Electric current flows through the magnet (on average) in the direction from the center of the magnet to the edge, so it flows in the radial direction. The magnetic field interacts with the moving electric charge to create a force perpendicular to both their direction of movement and the magnetic field. 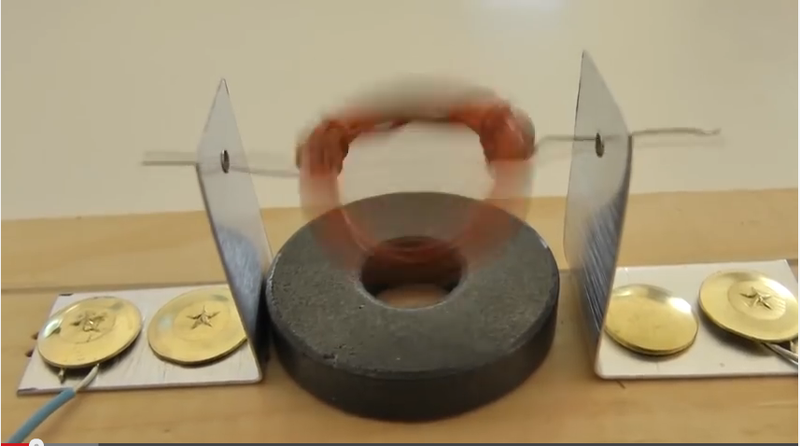 Since the field is along the symmetry axis of the magnet and the charges are moving radially outward from that axis, the force is in the tangential direction, and so the magnet begins to spin. 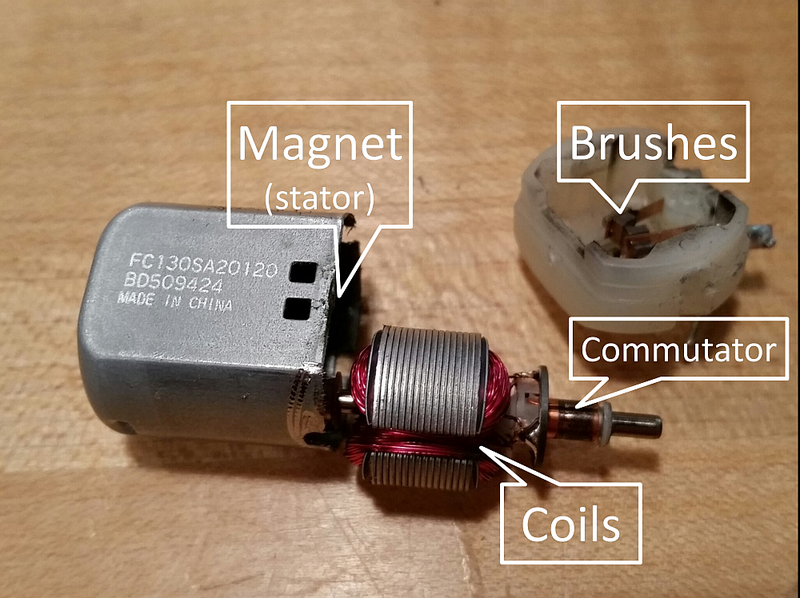 This is called a homopolar motor because you never need to reverse the polarity of any motor component during operation, unlike the other types of motors shown here. 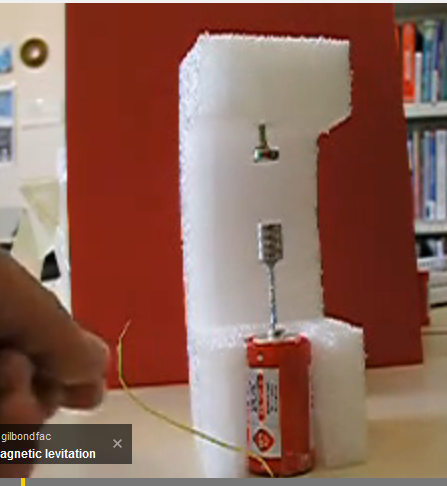 Lorentz Force: The force that is exerted by a magnetic field on a moving electric charge.